This article first appeared on 10/16/18. Just checked the box-office (fauevents.universitytickets.com) and there are a handful of really good seats left for this show. Just a heads-up, the reunited- The Cyrkle (which disbanded over 50 years) is off the chart dynamite- and is an absolute must see! * Stars Of The Sixties. Stars of the 60s return to FAU with what might be our biggest cavalcade of hit-makers yet! 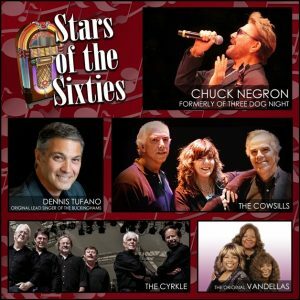 Starring… Chuck Negron, formerly of Three Dog Night (lead singer of “Joy to the World”, “One”, “An Old Fashioned Love Song”, “Easy to be Hard”, “Pieces of April” & many more), the reunion – after 50 years – of The Cyrkle (“Red Rubber Ball”, “Turn Down Day”), Rock & Roll Hall of Famers The Original Vandellas (“Dancin’ in the Streets”, “Heatwave”, “Jimmy Mack”, “Nowhere to Run”), Dennis Tufano, original lead singer of The Buckinghams (“Kind of a Drag”, “Don’t You Care”, “Susan”, “Hey Baby! They’re Playing Our Song”) and a very special unplugged performance by The Cowsills (“The Rain, the Park and Other Things”, “Hair”, “Indian Lake”). A fun one-night-only reunion of the artists who created the soundtrack of your lives – featuring 9 original members amongst these 5 of the biggest hit-makers of the 60s! Presented by the producers of Pop, Rock & Doo Wopp Live!, Praia Entertainment Group. I’ve seen both Negron and Tufano and both put on a terrific show. I saw Negron a couple of years ago at The Amp in Pompano and he put on a great show. I’ve seen Tufano on a couple of FAU shows and he was terrific. I haven’t seen the other acts listed and I’m really looking forward to seeing them at FAU. I’ve seen Tufano twice. He is terrific.